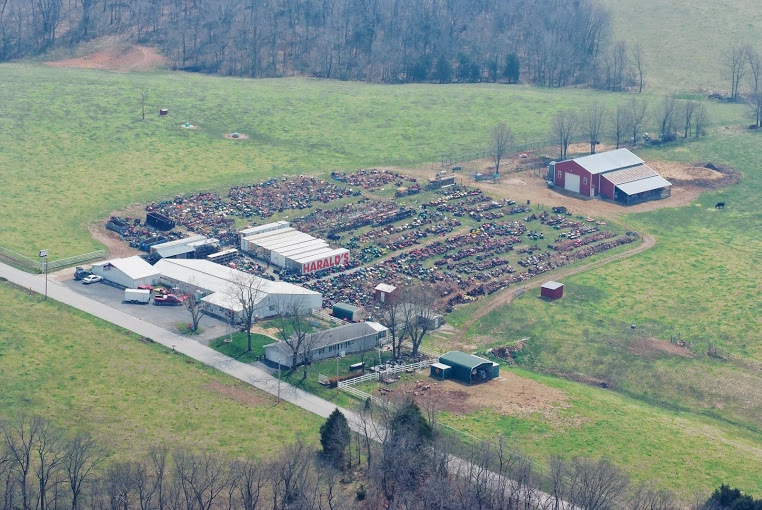 "Missouri's Largest Lawnmower Salvage Yard"
Specializing in OBSOLETE & HARD TO FIND parts. Acres of salvage as well. We have it all! Whether that is a true statement or not, I’m not sure, but we sure do have a bunch of everything…. Harald’s Small Engine has been collecting obsolete and hard to find parts for 30 years now and needless to say lawnmower salvage as well. With buying out shops that have gone out of business over the years we have put together one of the largest inventories of NEW old parts around and if we don’t have it new then there is a good chance we might have a used part for you. Even though the price of scrap metal has soared people will still bring their “dead” mowers to us and drop off so we never know from one day to the next what we might acquire. Richard, the founder and creator of this salvage yard thrives on BUY, SELL and TRADING with folks and not just for lawnmowers. Richard will trade for just about anything that he finds of interest. We have on most days a large selection of USED lawnmowers: Riders, Push mowers and Zero Turns. Also we have a large selection of CHAIN SAWS, all makes and models. Concrete saws, pole saws, and water-pumps are something you may find here also. All used equipment we do sell has been inspected to ensure it is in top running condition before sale. Husqvarna….. Worldlawn….. Columbia….. Country Clipper….. Big Dog and…..
Don't forget, we have Trailers full of used and salvaged chainsaws, trimmers and engines for parts. Take a look around our website; we're sure you will find that part you are looking for! Customer satisfaction is our FIRST priority! © 2013 HARALD'S SMALL ENGINES, INC. All rights reserved.